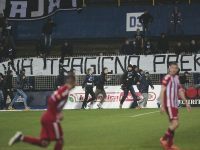 Angry Zeljeznicar fans stormed the pitch following a 1-0 home defeat to Zvijezda 09 on Sunday. Hertha Berlin ultras clashed with riot police at the Westfalenstadion during Saturday's Bundesliga match with Borussia Dortmund. Slavia Prague fans clashed with stewards inside the Parken Stadium after the side's Europa League match against FC Copenhagen on Thursday night. A Polish Cup match between Wisla Sandomierz and Korona Kielce was halted on Wednesday after a pitch invasion. 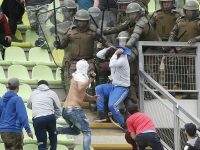 Santiago Wanderers fans fought amongst each other in the stands at the Estadio Elias Figueroa Brander during Sunday's match with Cobresal.